We moved about a week ago, and our lives are completley and totaly turned upside down. It is all good though, because my brother came for a visit the day after we moved and he hasn't been here since 2007. We've been going out to different restaurants that he wants to try out, cooking (what I could in half unpacked kitchen) things he wanted me to make him while he is here, and just hanging out with the kids. And Yesterday my mom came as well. It is truly a full house and it's awesome. But to say I've hadn't had time to write a new blog post is putting it mildly! Until then, please enjoy in this yummy recipe! 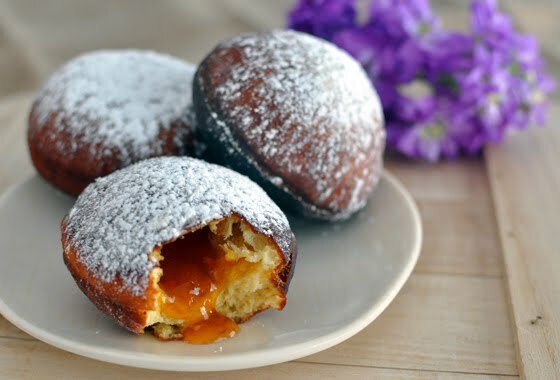 These are really Croatian doughnuts or 'Krafne', but they are much closer to a beignet than to American doughnut, and they are also made in February when it's time of Carnival (Mardi Gras, 'Maskare') so I figured it would make more sense to call them beignets. 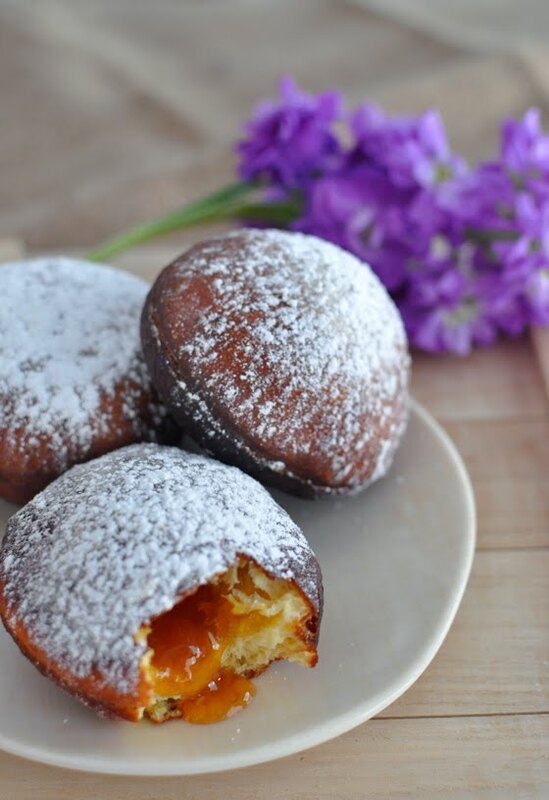 These beautiful fried goodies can be eaten just rolled in confectioners sugar or filled with a choice of marmalade or even melted chocolate. My favorite is without a doubt apricot marmalade It all comes down to what our mama did for us when we were growing up, doesn't it? *Croatian Rum is very often used in cooking and it tastes like American spiced rum with a good amount of rum extract in it. Whenever I do a Croatian recipe that calls for rum, I mix some extract into spiced rum to get those flavors. I actually have a bottle of spiced rum already mixed with rum extract and that is my cooking rum! Sift the flour and mix all the dry ingredients. Beat the egg, egg yolks, milk and rum, add butter and mix. Slowly start adding wet ingredients mix to the dry ingredients mix. I do this in my kitchen aid but my mom does it by hand on the table. Beat it for about 10 minutes with the dough hook. ** You are looking for nice soft dough but not too sticky so if it seems too dry add some water to it, slowly. Also, if it seems to wet and soft, add some flour to it. Put into a floured bowl and let proof for 3 to 4 hours. After the dough has risen, roll it out on a well floured surface to about 1/2 inch or so. Cut your shapes out (I use a glass for this, you can cut them in triangles or squares, whatever you like) and put them on prepared surface which is a tablecloth or a kitchen towel with a floured baking sheet on top. Cover with a kitchen towel and let sit for at least another hour. Fry them in at about 2 inches of oil, and don't let it get to hot. Medium heat works best. You will want to cover them on the first side (about two minutes) and when nicely golden brown turn them over and fry for couple of more minutes. When done, take them out and let stand on a paper lined plate for a little to drain the excess oil, they are best served warm, always with some confectioners sugar on top. 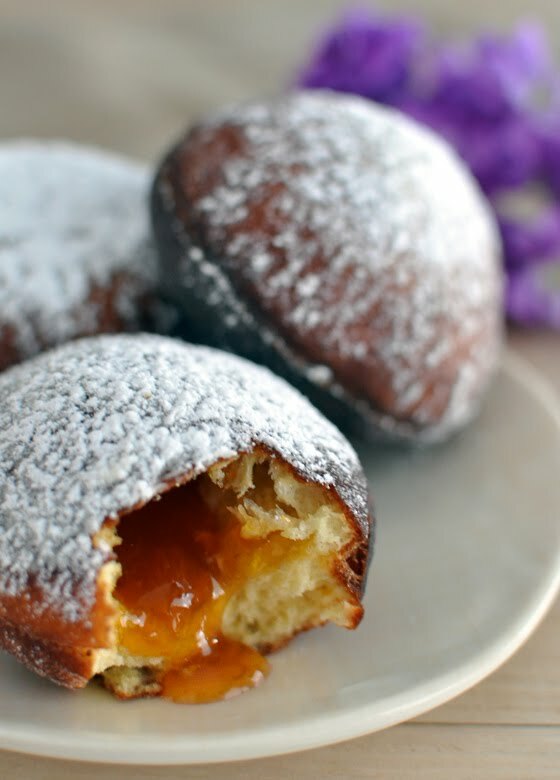 If you like you can fill them with marmalade or chocolate. Either use a piping bag with a round tip for this or just spoon it on. I go the rustic easy way. Spoon.